Top Shelf Productions, 2016. 246 pages. 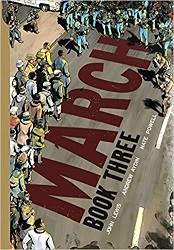 I was at the Youth Media Awards in Atlanta, Georgia, on the Monday after Trump’s inauguration, when this book by John Lewis won an unprecedented four awards, and not a single Honor among them. Atlanta is John Lewis’ home district, so he was there, and had participated in the weekend’s Women’s March. Later that day, I went to the YALSA Excellence in Nonfiction Award program and heard John Lewis speak. Every speaker mentioned how thrilled they were to be in the room with him. After that, I received a free copy of this book, got it signed, and shook his hand. And this book continues the telling of his story, in graphic novel form. This volume 3 contains more violence than the earlier volumes. It begins with a bombing of a church in Birmingham on September 15, 1963, and continues through Bloody Sunday on March 7, 1965, when marchers were met with violence at the Edmund Pettis Bridge and John Lewis was hospitalized, and ends with the signing of the 1965 Voting Rights Act into law. The whole story is framed by looking back from the day of President Obama’s Inauguration – a direct result of the work that was done in the 1960s. The book is about idealism and about conflict – from both within the movement and outside it. It’s also about nonviolence being met with violence and standing for what you know is right. An accessible look at history through the eyes of someone who was there, this book is a monumental achievement and deserves all of the many awards it has won. I’m putting this on my page for Children’s Nonfiction, because it is written for teens (and I don’t have a teen page for nonfiction). But be aware that the level of violence is high – because that’s what these activists faced. They put their lives on the line for what’s right. Amulet Books, New York, 2014. 240 pages. El Deafo is an endearing and engaging graphic novel-style memoir. I’m not quite sure why everyone is presented as human-rabbit creatures, but that’s part of an informal graphic style that will pull kids in. Cece Bell got meningitis when she was very young – and lost her hearing almost completely. 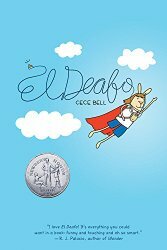 El Deafo is her story of growing up deaf – wearing hearing aids, learning to lip read, and navigating the ways different people treated her because she was deaf. Cece got to attend Kindergarten in a class with other kids with hearing problems, but her family moved and she had to go to first grade with hearing students. She’s given a high-powered hearing aid connected to a microphone the teacher wears around her neck. Cece discovers she has a superpower – she can hear what her teacher is saying or doing anywhere in the building. But making friends is difficult. First, there’s the friend who dominates everything the two do together. Then there’s the friend who always e-nun-ci-ates (which is harder to lip-read) and makes a huge deal of Cece’s deafness. Cece also illustrates ordinary friendship perils that become larger. For example, she can’t lip read at a slumber party once the lights are shut off. And that boy she has a crush on – what will he think when he sees her with her extra-large hearing aid at school? This book’s friendly format will catch kids’ interest, and give them a glimpse of what the world might be like if you couldn’t take hearing for granted. No preaching is needed – Cece tells her compelling story, and kids’ eyes will be opened. Houghton Mifflin Harcourt, 2013. 80 pages. When I see a history book for kids presented in comic book form, full of facts and graphic details, I think, “Goodness! Why don’t they all do it this way?” I can’t call it a graphic novel, but it’s a graphic history book. It’s in comic book form and doesn’t only tell you what the Dust Bowl was like, it also shows you. I’ve heard a lot about the dust bowl. But now, with the aid of these pictures, I feel like I know what it was like to experience it. Bugs that should have died in colder, wetter weather or been eaten by birds and bats killed by the drought now turned up everywhere. Centipedes crawled across ceilings and walls, tarantulas marched across kitchens, and black widow spiders lurked in corncribs and woodsheds. The picture with that shows the woman who is speaking looking askance at a table covered with ants. Storms could blow for days and be immediately followed by another and another, making for unrelenting blows for weeks on end. Raging, grit-filled winds shattered windows and scoured the paint off houses and cars. Trains derailed. Telephone poles were knocked to the ground. 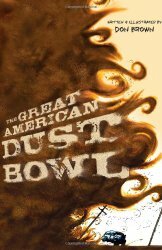 Altogether, Don Brown gives readers vivid detail about the Dust Bowl, and they understand some of the causes and the scope of the problem. (I had never realized before that during that time, even New York City got hit with a dust storm that made lights necessary during daylight hours.) They even have some warnings that it could happen again. The book is artistic as well. If you leaf through the pages, you notice right away that Don Brown has used different panel arrangements on each set of pages, and keeps the story varied and interesting. This is history that will stick with you. Top Shelf Productions, 2013. 123 pages. This is not a graphic novel, it’s a graphic memoir, and all the contents are true. Congressman John Lewis tells about what it was like for him as a young man involved in the Civil Rights Movement. The comic book format combined with the personal remembrances give this book an immediacy that will stick with the reader. There’s a frame that’s in place on the day of Barack Obama’s inauguration. The congressman is telling two kids visiting his office what it was like when he was their age. And then he tells how he first heard about people speaking up for civil rights, and how he went to nonviolence training, participated in and organized sit-ins, and began the Student Nonviolent Coordinating Committee. This is only Book One. There’s a sort of prologue scene crossing the Edmund Pettus Bridge during the March on Washington. We don’t get that far in the story, though we do learn, right at the start, that of all the speakers that day, John Lewis is the only one who’s still around. This graphic memoir makes history come alive in a dramatic way. I’m reading it because it’s the last contender I hadn’t read for School Library Journal’s Battle of the Books, which starts next week. I’m not surprised to find some powerful reading here. It fits in well with the other contenders. Roaring Brook Press, New York, 2011. 492 pages. This book reminds me of Mo Willems’ You Can Never Find a Rickshaw When It Monsoons. Both are about overseas adventures taken by people fresh out of college, complete with plenty of illustrations. To Timbuktu, however, has more text, since the cartoonist, Steven Weinberg, teamed up with a writer, Casey Scieszka. It’s less light-hearted because of having more text, but it also gives a lot more information about their cross-cultural experiences. Casey and Steven met as students abroad in Morocco. They decided, after graduation, that they would go overseas together. This is the story of their adventures. I think they had the most fun in China, where they spent the first six months and both taught English. That section is especially fun, with the descriptions of the kids and their antics trying to teach. After that, their time was a little less structured. Casey had a grant to study Islam in the schools in Mali, and Steven was working on his art. The story is fascinating, and you’ll learn a lot about the countries they visited. Okay, I confess: I didn’t even know that Timbuktu was in Mali, let alone what living there is like. I didn’t know there’s a language spoken in Mali called Bamankan, or much about Mali at all. I actually met Casey Scieszka at ALA Annual Conference a couple years ago when I was fangirl-ing her Dad, and I liked her very much. They said at the time that she was writing a graphic novel. This isn’t really a graphic novel; it’s an illustrated memoir. But it’s heavily illustrated, and that makes it all the more fun. After all, since they visited these cultures I know nothing about, it’s nice to have pictures to help understand. This is an excellent book for anyone who’s ever dreamed of picking up and traveling around the world. You can enjoy their experiences without having to get hot and dirty. Scholastic Press, 2011. 64 pages. Drawing From Memory is not quite a graphic novel (make that graphic biography). There are some speech bubbles, but the majority of pictures don’t have them. This is a remembrance with lots and lots of pictures. The pictures vary from drawings to photos to comics to realistic paintings. Allen Say moved into his own apartment (from his grandmother’s house) when he was not-quite thirteen years old. Shortly after moving to the apartment, he read a story about a boy three years older, who was apprenticed to Noro Shinpei, one of the most famous cartoonists in Japan. Allen decided to find him and ask to be an apprentice as well. The book tells the story of Allen’s years with his Sensei, learning and growing, and eventually getting the chance to go to America. He talks about the process of learning to draw, those who learned with him, and especially the close relationship with his teacher. Best of all is the wide variety of illustrations that accompany the story and make it alive. This is one of those wonderful books in large format that may get hidden in the Biography section of the library. This isn’t the sort of story you’d want for a report, but it’s very much an inspiring story of someone’s life and about finding and following your calling. This is a delightful book. Source: This review is based on an Advance Review Copy I got at 2011 ALA Annual Conference. Graphix (Scholastic), New York, 2010. 214 pages. Smile is a graphic memoir — graphic meaning the comic-book format, with no reflection at all on the content. In this book, the author tells the true story of the awful saga with her teeth when she was in middle school. Just when she was ready to get braces, she had an accident and knocked out one front tooth and jammed the other into her jaw. The dentists and orthodontists made heroic attempts to fix and straighten those teeth, and this book tells vividly, with a nice sense of humor, the long involved process. Of course, just telling about teeth wouldn’t be interesting. 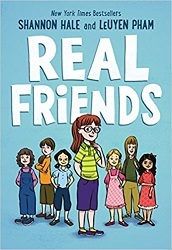 But Raina Telgemeier puts in the story of finding her place in middle school and finding out who her true friends were. In middle school, no kid wants to stand out, but Raina’s smile alone made her look different. This book will draw kids to pick it up and read it to the end. The vivid pictures draw you in, and you’ll find a certain fascination with all she had to go through. Ultimately, she learns to face life with a smile! You are currently browsing the archives for the Graphic Memoir category.